The map() function iterates or loops through an array using a callback function (or the mapping function). See the syntax. Each element is sent to the callback function, which then returns a new element, and the map() creates a new array using the returned elements. In the first example, I have an array of code and each code is an alpha-numeric value. I want to extract only the text values (alphabets) and create a new array out of it. In the above example, the callback function (getOnlyText ()) takes a value as parameter. The array map() calls the function using one element (from the parent array "arrCode ") at a time and the callback function returns the text value. Note: The map(), internally loops through each element in the array. It actually spares us from using a for loop or even functions such as the .forEach() or for (… of), to achieve our goal. In-addition, see how I have used ES6’s arrow function (=>), with my function. The arrow function is another key feature, which was introduced in ES6. In this second example, I am using the map() function against a JSON array, to create a new array. The JSON has three objects, the id, name and type of birds. Using the map() I can filter out the elements of my choice from the array. 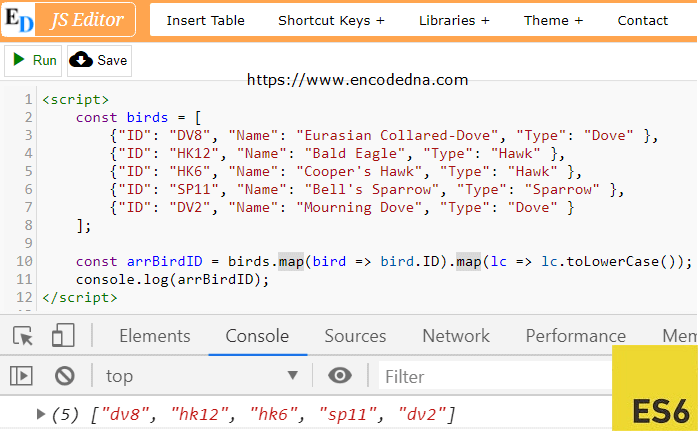 const arrBirdID = birds.map(bird => bird.ID);	     // Or, simply use bird.Name to get the values from the “Name” object in the JSON array. See how I have used the map() function in this example. That's another way you can use the map() function on an array. And, again, I have used the arrow (=>) function to shorten my code. This is like saying, map all the IDs and convert it into lower case. See the bottom of the image. 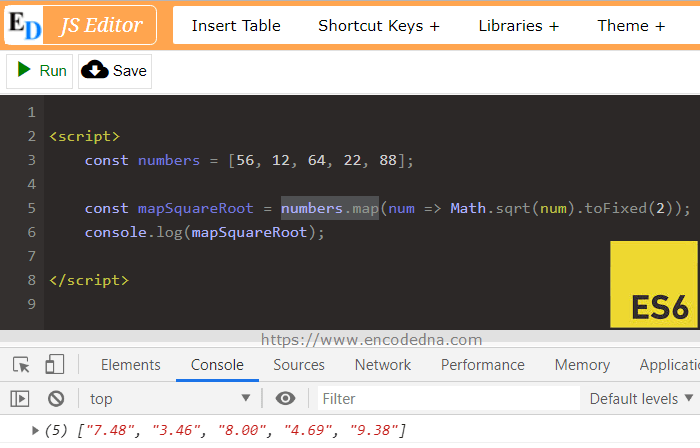 In the above example, the map() creates a new array of elements, which is the square root of each number in the parent array. To get the square root, I am using the pre-defined Math.sqrt() method. The map() serves as an alternative to your for loops. It reduces the length of your code and all it needs is a little practice. I have learned few tricks using this amazing ES6 feature and now, you too know how to use it. Don't forget that you can use multiple map() functions in a single statement.